Few have had more impact on hockey on both sides of the Atlantic, as both player and hockey administrator, than Anders Hedberg. He broke through as a star of the Swedish National Team in 1970 at just 18 years old and subsequently signed with the WHA Winnipeg Jets in 1974. During his time with that team, he skated on one of professional hockey’s most exciting international lines, along with Bobby Hull and fellow countryman Ulf Nilsson. Hedberg led the Jets to WHA titles in both 1976 and 1978. Following a seven-year career with the New York Rangers, he worked in different capacities with the same NHL team, as well as with the Toronto Maple Leafs and the Ottawa Senators. He is now back with the Rangers as a European pro scout. 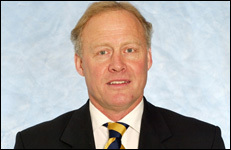 Hedberg was also the first professional GM of Sweden’s Elite League with AIK from 1987 through 1991 and led the Swedish National Team Program from 2000 through 2002. Prior to his professional career, Hedberg completed a degree at the Swedish School of Sport and Health Sciences (GIH).